Cyril Connelly famously said, "There is no more sombre enemy of good art than the pram in the hallway." Monty Python famously said, "Cyril Connelly?" Me, I've never famously said anything, but I will say this: If there's ever an election, mark me down as Pro-Baby. Call me naive, but I'm not too worried about babies destroying good art. I'm not sure I even know what good art is. I mean, take games. Have I ever played a game I'd call good art? I dunno. Probably not. Sometimes you just gotta play a game that's completely visceral, that cuts to the bone, grabs you by the gumballs and won't let go; a fire tornado of a game that takes every drop of blood, sweat, tears, guts and (especially) testosterone your he-man/adonis body can give it. Babysitting Mama caught my eye for several reasons, but the obvious one is that it’s the only video game I’ve ever seen that uses a baby doll as a controller. Gimmick schmimmick, I think that’s an incredible idea. It’s the sort of out-of-the-box thinking you expect on the Wii, and I say well done to the good people at Majesco for even trying it. Teddy Ruxpin meets Carnival Games. I'm totally behind this sort of thing, philosophically at least. Pictured: The sort of thing Kris can get behind, philosophically at least. The doll itself is pretty well made. It's cuddly. Fuzzy, even. The stitching is good. Uh… the velcro on the... uhm... diaper seems to… uh… stay on… Look, what do you want from me?! It's a doll. I can't review the doll. Seems well made to me, but I'm not an expert on these things. I will say, it's got a flat face, presumably so its features could be printed on, which is a little weird. But you get over it. So… the doll gets 4 out of 5 stars from me, a total ignoramus of the arcane knowledge required to evaluate a doll. When you first turn the game on, you get instructions on how to stuff the Wiimote into the doll correctly so you can play the game. There's a bit of accidental meta-comedy where it tells you to remove the Wiimote cover - sometimes colloquially known as the Wiimote "condom" - before set up. Well, at least Majesco knows exactly how babies are made. You never use any of the buttons on the Wiimote, but the Nunchuck does thread out of the back of the baby for use as a rattle, spoon, etc. As a control mechanism, it works. But it also sort of suggests that the baby has a tail. Overall, I'd say it's a clever use of the Wiimote, though - certainly more interesting than all those plastic tennis rackets you used to see. And the speaker in the Wiimote means you can actually hear your baby doll giggle and cry. Without pulling a string or anything! Now, I’ve never played another game in the venerable Mama series, so this also serves as my introduction to its world and characters. First impression? I like Mama. She’s got a cute design, a peppy attitude and a cool accent. (Steph and I debated for a while if she was supposed to be German, Russian, French or Japanese. I’m pretty sure it’s Japanese, but I suppose it doesn’t really matter. It might as well be Mama-nese, for all it affects the gameplay.) It's endearing to hear Mama say things like "Soothe the baby" and "Don't make that face!" in her unique accent. "What a cutie" becomes "Vot a kootie!" and "I wonder how you did" becomes, "I vonder how you deed!" Again, I point this out for no other reason than it adds to her charm. She's one memorable Mama, at the very least. Sort of the Martha Stewart of gaming. So our heroine Mama - just like many real mamas - seems to be beleaguered by domestic responsibilities. In addition to her usual household chores, it appears she's running a daycare out of her house, now. Throughout the game you discover she's taking care of about a half dozen different babies, all at the same time. Babysitting? She's baby hoarding! Come to think of it, the game never reveals where she got all these babies from. Troubling. Well, just to keep this from taking a dark turn, I'm going to assume she's an accredited caretaker and look the other way. Or forget Martha Stewart because she's gaming's equivalent of the Octomom. EDIT:Why isn't there a punk band with that name? EDIT EDIT: Turns out there is. In addition, Mama’s got a dog - who’s always annoying the babies - and a redheaded, be-mulleted pre-teen who’s constantly tearing up the house. That leads to some questionable babysitting practices where Mama puts the baby down in order to handle some other domestic situation caused by them. And while it’s probably okay to set the baby in the crib to deal with trouble on the stove, I’m not so sure Mama can really justify putting the baby down because she needs to run to the store before it closes. Really, Mama. Plan ahead. I should mention the game repeatedly warns you not to shake the baby if you handle it too roughly. It's the only time Mama really gets close to scolding you. (In fact, you can flood her bathroom and she'll still say, "That's OK" and give you a bronze medal. So, discipline isn't Mama's thing.) You could try to make comedy out of tossing the baby doll around - and I'm not so mature that I didn't consider doing that - but, in the end, I personally appreciate that the game goes the extra mile to teach kids not to shake babies. Every now and then you'll get the warning in a situation that didn't warrant it, but mostly you get it when you're clearly doing something wrong. As it should be. In all, there's 40 minigames to unlock, 6 different babies to play with, some photographs to collect, a two player mode... and that's about the size of it. All told, there's enough in the package that you can't really fault it for lack of quantity. Some quick improvisation to get a second controller for the 2 Player mode? Or a monkey with a jetpack? I report, you decide. What you can fault it for is being pretty repetitive. Some of the games aren't all that compelling and the game brings you back to them many times. The worst on that score is a game I'm going to call "Move The Baby". Mama's got a crying baby so, to calm the baby down, she makes you move it in various directions. This game reappears in the main game many, many times and it always goes something like this: Move the baby… TO THE RIGHT. Move the baby… TO THE LEFT. Move the baby… UP. Move the baby… DOWN! It's like aerobics using a baby as a free weight - like a baby-themed Wii Fit event. No, it's not even that. It's Simon Says: Baby Edition. And it's just not very fun, but you'll do it over and over again. On that score, it occurs to me that these must be the pickiest babies ever. You move them to the left instead of to the right and they start crying. You shake the rattle one too many times, they start crying. You pat them one too many times while burping, they start crying. They tear up a newspaper and you fail to collect all the pieces, they start crying. I feel sorry for Mama. She just wanted to run a day care, and she gets stuck babysitting the world's most uptight, high-maintenance babies ever. "Oh, the existential angst. How it burns in me." Really, though, most of the games are diverting enough. Quite a few of them eschew using the doll at all, in favor of nunchuck based control. While that minimizes one of the main draws, many of the best mini-games use this set up, so I can't really knock it. Apart from the fact it suggests the key to being a good caretaker is in your thumb control. But the major complaint I have with Babysitting Mama turns out to be fundamental: As great of an idea as the doll controller seems, it doesn't really work in practice. Because actual babies are fragile, the ways to interact with the doll are limited. You can rock it and that's about all there is to do. I truthfully had more fun with the baby-themed games that didn’t require moving the baby around, which blunts the original appeal of the game. The trouble is, you never really look at the doll when you are taking care of it. Instead, you just stare at the TV. Which, okay, that might have been my own mother's preferred method of child-rearing, but it's not really the best idea for a game. It also results in some terrible miscalculations, as when I caught myself holding the baby upside down by its head while rocking it. I don't think Child Services would accept, "I was looking at the TV," as a valid excuse. I can imagine a way around this problem: Give the rhythm-based games an identifiable soundtrack to follow, so you could focus on the doll while judging the motions with your ears. Take the TV screen out of the requirements to play. But in one of the more frustrating moves I've seen in a game lately, the rhythm-based portions ignore what's going on in the soundtrack completely. So you move to a completely different beat than the music. That feels very bizarre in practice. There's more. Playing Babysitting Mama with my wife inspired a conversation about how she used to play with dolls when she was a little girl. Turns out, she used to create fake medical charts for her Cabbage Patch Kids and then pretend she was a pediatrician. She'd listen to their heartbeats, diagnose their illnesses and give them medicine. And it occurs to me that that's how you really play with baby dolls - with your imagination. Babysitting Mama tries to find a way to take that imaginative play and mix it with video games. And it just can't compete. In any competition between pure imagination and software, imagination wins every time. That said, I think it's a noble experiment and probably fun enough in short bursts. I can imagine this being a hit for half an hour at an 8 year old's slumber party, as everyone gets a chance to pass the baby doll around and give the gameplay a spin. I wouldn't expect it to last much longer than that, though. And, in a way, that's a shame. As I was playing Babysitting Mama, it occurred to me how fertile something like domestic life can be for video games. I mean, I've played so many countless games where I shoot an alien in the face (or a demon)(or a dinosaur)(or a terrorist) that it's refreshing to play a game where I chase a pack of crawling babies around trying to pat their butts with baby powder. After all these years, that's something I've never seen in a game before. In a strange way, it seems not only more original but more of a fantasy than yet another round with space aliens. But, finally, you end up in a place where you realize you’re a grown man wiggling a flat-faced baby doll around because a computer is telling you to. I dunno. Is that really entertainment? Is that really good art? Too bad Cyril Connelly isn't still around to answer that question. Me? I almost need an excuse for myself at this point. Or an explanation, at least. Why on earth would a 35 year old man, like me, spend any of his precious time playing Babysitting Mama? And guess what? It turns out I have a good answer. You see, I need the practice. Question: Did playing Babysitting Mama make you realize much too late that having a real baby is pointless in a world where Babysitting Mama exists? You're gonna be the best of dads! Oh yeah and congratulations and such! Am I going nuts or didn't you already announce this?! Or wait... was that Paul? Gosh everyone is having babies! It was Paul. This is the first place I've gone public about it. You guys were there when I came out of the baby closet. You're keeping the baby in a closet?! Kris... come on. That's no way to treat a baby. Well, that was a surprising twist and way to end the review! Congratulations Kris! What?! You mean having a baby is going to affect the way I live my life? I need to rethink this. Order of baby appearance for 2014 should be Lou/Ploot/Kris. I declare 2014 the Negative World Year of the Baby. It's not too late to get your order in, people! Oh and I have two more nieces / nephews coming in 2014. Well, 2 so far, but my one sister is due for another one since she has pretty much consistantly gone at the rate of 1 baby per every 1.5-2 years since getting married. Ug at this rate if / when I get around to having kids mine will be too young to hang out with their cousins and miss out. I'm telling you, everyone who's anyone is having a baby in 2014. The pressure to conform is IMMEASURABLE. Pretty funny review. What did you actually do for the 2 player mode? Use the monkey or Wiimote by itself? Do you think this causes an imbalance in the competitive nature of the game? 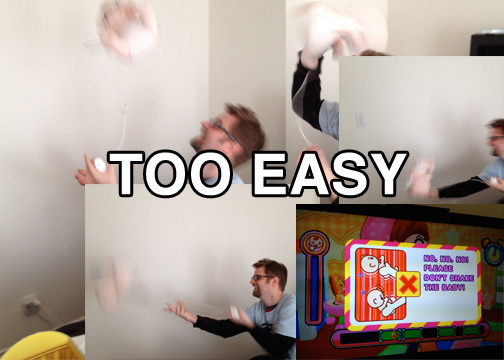 I should have mentioned, but it turns out the 2 player games are all the Nunchuck focused ones. So you could play it without the doll/monkey. Come on man, where's the due diligence? That's so Stephen: "Who cares about the main campaign? How's the multiplayer?" 5 shotting people is on its way out. Out crawling them in a baby race is the next big thing for MP (needs a snappier phrase though).